I have a question about a pistols I have and I will get to that, but first of all, I actually found soft shell gun case at goodwill of all places that holds 6 of my semi autos and clips. It cost me a whole $2.. Got to love that goodwill hunting! 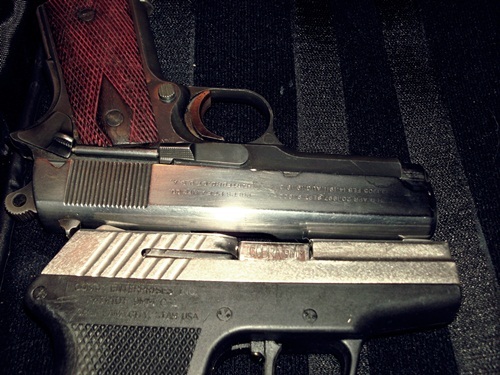 The Colt 1911 my dad cut down into a compact back in the late 1970s I have posted before here after I colored the walnut grips to make them more reddish color. But I have removed the bluing from the slide since then and polished it. I was going to re-blue it, but after seeing it polished up, I liked it too much. But it’s a 45acp , 6.25 inches total length, 6 rounds +1, and my dad made it long before compact was popular. So that I one is my pride and joy I would say. And accurate as hell too. 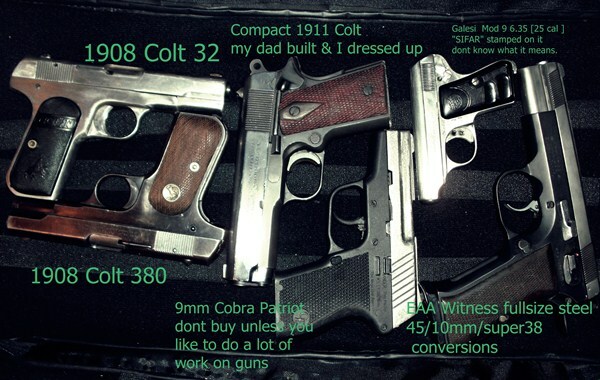 I once made the mistake of buying a Cobra Patriot 9mm for a CCW gun. Dont do it. Its total crap. It took a lot of work by my dad and myself just to make it shoot more than one round without jamming. Sure, they have a lifetime satisfaction guarantee, but after sending it back 3 times at a minimum of 3 months wait, only to get it back still not working I gave up and gave it to my dad to work on. Just dont waste your money on a Cobra firearm unless you get it really cheap and like to work on guns. But , one thing is that cause it was cheap, I don’t mind experimenting on it. The slide is stainless and I wanted a different finish on it. I tried sandblasting it but didn’t like it, so I sanded it with an orbital sander and 32 grit, and it looked very cool. I then went over it some 150 to smooth it a bit, but still leaving the deeper marks from the 32 grit visible. The photo doesn’t do it justice. The last thing is, I have a 1952 Galesi model 9 25acp which in the late 1970’s I trade a Edelbrock 302 ford low rise 4 barrel manifold for. It was a spare from a 69 Mustang I had then, and I wish I would have never sold that car. Had a 302 boss in it and ran like a bat out of hell. But anyway, one thing I never did find out was what a stamping on the left side means. S I F A R ??? If anyone has any idea, I would really appreciate it. The gun is ok, and I did a few things to it, like drilled the trigger to make it look more like a comp trigger, and notched the slide so it would lock in place. Sifar is the abbreviation for Italian armed forces intelligent services, kinda like our cia. If I remember history, the rifle used by oswald to kill President Kennedy was also stamped SIFAR. Check out the link below and you can read about some reference to this, it's a big page so it might take a bit to load. 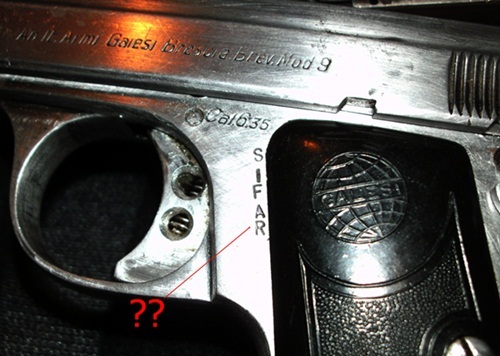 Since the Galesi is an Italian firearm, I'm guessing the SIFAR (Information Service Forze Armate) stands for the Italian reconstituted political police established in the late 1940s (once the Fascist OVRA was dissolved). Europeans seem to have a tendency to arm their police with calibers the rest of the world regard as bad ballistic jokes. And Omini types a little faster than I do! Stovepipe, yeah, I like it too. I remember when my dad made it, he spent over a month in the basement sawing, filing, grinding, welding, and more just to make it. The bad part is he only made one clip for it, and you cant find clips for it and I tried all kinds of compact clips. His is either to tall or short for them. but it does use standard 1911 clips, so I am going to try to make a few spares for it myself. Also have a colt challenger woodsman 22, but it wont fit with the rest of the slide action firearms in the case with the rest of them. "The post-WW II importations of surplus Italian Model 91 rifles chambered for the 6.5mm Carcano cartridge (or 6.5mm X 52mm Mannlicher-Carcano), and their subsequent sale to American shooters at justifiably low prices has given wide distribution to this firearm. In retrospect, the prices may not have been low enough. The action of the 6.5mm Carcano is sloppy and lacks the extra margin of safety of the best military actions; the finish of the rifle is crude. Scope mounting is difficult and essentially not worth the effort." I LOVE YOU, LADY LUCK !!! reading the link Omni, its really fascinating. But while reading it, I was wondering how and why the pistol made it to the USA, if it was an SIFAR issued firearm? And I how the guy I got it from came by it ? I not sure, but I dont think he was Italian, not with a name like Klienschmidt. 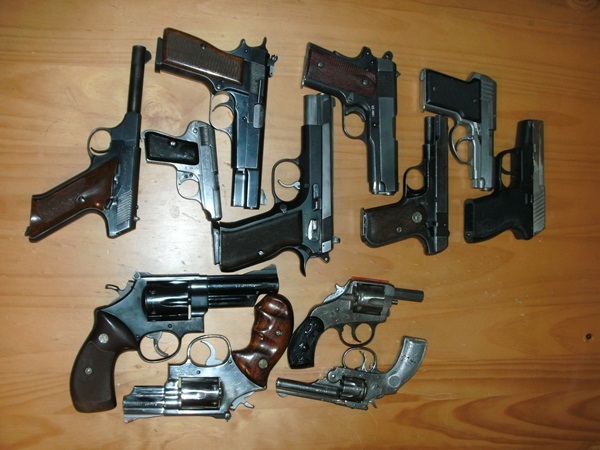 Ok, now just cause I can, here is a photo of my pistol collection, minus the 32 1908 colt, which I didnt have together at the time of the photo. As you can see, the 1911 my dad made still has the bluing on it too, but besides that, this is my hand gun arsenal so far. I still have more to bring home. some are inherited, some are because I was once married to an anti gun Australian who wouldn't allow me to keep any guns in the house. Well, she is gone, and the guns are coming home! I was wondering how and why the pistol made it to the USA, if it was an SIFAR issued firearm? Lots of European firearms came to the States either as military surplus or from having been "liberated" by some of our sticky-fingered occupying forces that were stationed there for quite a few years after WWII. It could have been determined as surplus when Italy "upgraded" to the .32 ACP. The mind-set of the European countries (and England) was (and still is to some extent) that since the general populace wasn't allowed handguns, the police or other official agencies didn't need firepower. I always think of the James Bond "Dr. No" where Bond is forced to give up his beloved Beretta .25 ACP for a Walther .380 ACP. The remark is made that the .380 would "slam a man to the ground". Since Fleming also makes several references to S&W revolvers having safeties, I certainly wouldn't rely on him for firearm info! totally agree singleshotlover.. Flemming is fiction. The 380 is not going to do a thing to someone who is full of adrenaline and trying to kill you. I know people who have been in Iraq and Afghanistan who said 9mm is totally useless most of the time. And a 9 is nothing more than a glorified 380. Guess that is why I understand that many are buying their own 45s and having them shipped to them there. Stopping power. I didnt know the upgraded to the 32.. thats like the difference between paper or plastic.. it really doesn't make any different in the scope of things. Actually- the model 40, I think it was called the lemon squeezer, had a grip safety if I remember correctly...top break revolver with a back-strap grip safety of sorts I think... for whatever reason I dont know. the Smith is a 38/357 model 66. I bought it off a Illinois State Police officer when they went to semi autos. its a great little gun. The other is a 44 mag 6inch my dad bought back in the 60's , I think. I have the original receipt around here somewhere. Havent look at it in years though. He reworked the trigger to a 2 pound pull, and its just to damn light for my liking. Im going to beef it up a little bit. You dont want a gun that goes off when you breath. Not a 44 mag at least. 44M with a 2# trigger? 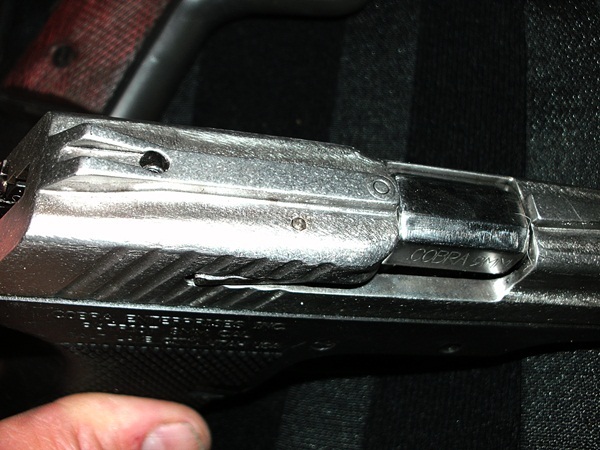 My Ruger SBH 44M has a 22oz trigger or thereabouts... and no one shoots it but ME. For 1911 mags if the standard hangs out a bit try a Chip McCormick w/ a modified hi-cap filler/bumper shaped to your choice then just run the standard mags...that might take up the gap betweem the bottom of the mag and the well and make it look neater etc....if I recall you can get them filler/bumpers for hi-cap mags seperately and they are easy to shape.